Teach your child the importance of honesty with the Christian music CD, Nathaniel the Grublet. Faced with a difficult decision, Nathanial must choose to follow his dishonest brothers or do what he knows is right. This delightful CD will captivate your family with story and unforgettable songs. Looking for quality Christian entertainment that captures your child's attention while teaching godly character qualities? Look no further! 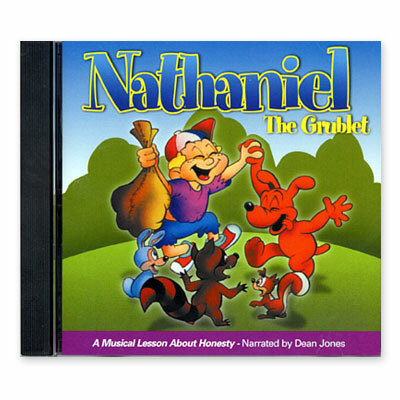 With the music CD, Nathaniel the Grublet, from Alpha Omega Publications, your child will learn a fun-filled, musical lesson in honesty! Follow along as actor Dean Jones narrates the moving story of Nathaniel and his dog Smuggles. Tempted by five dishonest brothers to steal instead of making an honest living grubling (looking for lost or broken items to fix), Nathaniel must face the biggest decision of his life! Not until Nathaniel meets the Master does his life begin to change. But there's more to this story! Nathaniel the Grublet comes with the words to each lively song so your kids can have fun singing along. Sure to be a family favorite, your kids will love listening to this CD over and over. Build solid Christian character values in your child the fun way! Order the music CD, Nathaniel the Grublet today!